Check out CIS of Western Nevada on the news! Nevada has one of the lowest high school graduation rates in the country. Only 73 percent of students graduate and for those who quit school, the trajectory of their lives is forever changed. There is a nonprofit on a mission to help students who would otherwise drop out using the simple, yet indescribable bond of community. Shyann Goins loves school, but it wasn’t always this way. Ms. Cervantes is a site coordinator at Vaughn Middle School for Communities in Schools. “The math tutor is actually on Thursday so if you can stay for that,” Ms. Cervantes encouraged Goins to seek help and keep her grades up in math. The non-profit is in five Washoe County schools with high dropout rates including Libby Booth and Natchez Elementary, Vaughn Middle, and Hug and Innovations High. They empower kids who might otherwise call it quits to stay in school. “What is an area you need the most support in right now,” asked Ms. Cervantes. Goins meets with Ms. Cervantes for mentorship and encouragement. Ms. Cervantes is someone who listens and guides Goins so she can achieve her goals in life. “I want to graduate from high school and then go to college so I can get a career,” said Goins . She wants to be a chef. 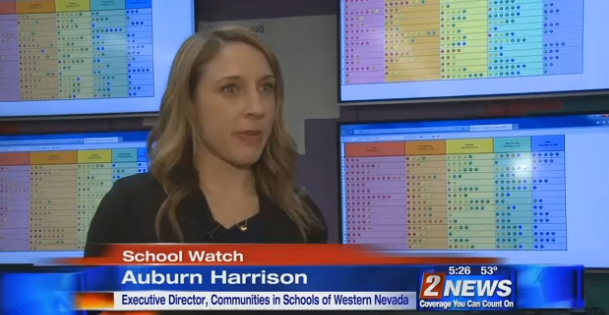 “It’s really taking a student and not worrying about where they came from and where they’ve been in their past behavior or attendance or grades and bringing them up to speed,” said Auburn Harrison, Executive Director, Communities in Schools of Western Nevada. Goins is learning how to be bold. Communities in Schools is a nonprofit primarily funded through Title I grants. They are having a fundraiser with drinks, food, and live music on February 22 at IMBIB Custom Brews, 785 East Second Street. Click here for more information.